this is my world, full of my friends, of my games and video I like!!! Enjoy this journey in a crowded world!!! 2009 is the year of the Dark Reign in the Marvel production, and it seems that few of the common heroes are ready to fight Osborn well-planned strike against the world. But all of his plans doesn't work well, and when he launch Hammer strike force against the Atlas fundation, he discover that the old heroes of the 50's are always here, ready to fight with their powers! 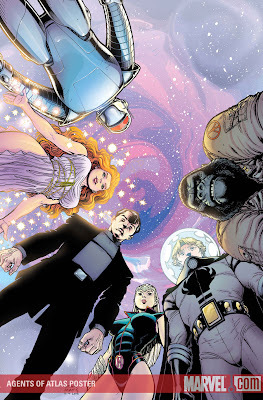 This is Agents of Atlas, lead by Jimmy Woo and standing for fight against all of the new threat of this new era. Je ne connais pas du tout... Il va falloir que je rattrape un jour mon incultisme en bds. they are the bests! I like the uranian and his flying saucer! I love that, it's one of my best, especialy for Namora! excellent team, with huge potential of meeting!!! very cool! I discover them in X men titles, and abandon this last for them!!! Dancing with my girl !